So, battle lines have been drawn, and each team now knows the immediate task ahead. For some there'll be joy as they see a clear way through to the knock-out phase, while for others there'll be gloom with the realization that, short of a miracle, their World Cup may well last just three games. The draw for the 2010 World Cup finals means the countdown to South African begins in earnest. No coach worth his salt will admit to either feeling though, as over-confidence piles on the pressure and sets you up for a fall, while a lack of confidence can be a self-fulfilling prophecy. Instead, they'll head home, diplomatic and purposeful, to plan their strategies. Ahead lies months of looking at tapes of the opposition; examining statistics; listening to scouting reports on this player and that; mulling over your squad selection; team formations; training schedule; accommodation etc. The list is endless, but no detail can be overlooked, because 99 per cent preparation tends to equal 100 per cent failure. So let's take a quick look at the groups. No doubt about the group of death, that's Group G.
Brazil, the five-times champions, are an obvious force; Portugal, who were semifinalists at the last World Cup, did not qualify well, but they have more than they showed; the Ivory Coast, African Cup of Nations runner-up, did not lose in the qualifiers, and have quality throughout; and North Korea, are an unknown quantity, who should be the whipping boys, but you never know. The Netherlands are the best footballing nation never to win a World Cup, but nobody's talking about the Dutch threat. They won their European group by a landslide, and their World Cup group with Denmark, Japan and Cameroon should afford them a comfortable passage to the knock-out phase. Germany and Ghana will not have things their own way in Group D. Serbia didn't stroll through the qualifiers, but won their group. And then there's Australia, who have quietly built into a real force. They dominated in the Asian qualifiers, and you'll remember how close they ran Italy in 2006. So this group could produce some drama. Argentina can't breathe that easily either. Former European champions Greece have, in Otto Rehagel, the anti Maradona - a seasoned methodical coach as opposed to the inexperienced Diego who manages by instinct. South Korea have a decent world cup pedigree, and then there's Nigeria, a nation that didn't qualify that impressively, but has proved capable of rising to the World Cup challenge in the past. If not the group of death, it's no cake walk either. South Africa will face a job to get out of their group, as we suspected. Unseeded France are clearly the favorites. Then it's a case of duking it out for second place between Mexico and Uruguay, with Mexico my tip to pull it off. 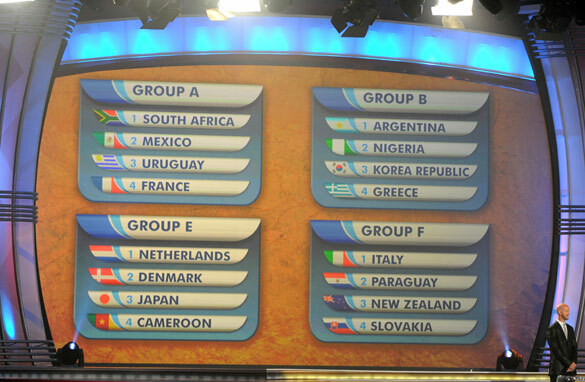 Bafana Bafana will need to really dig deep to avoid being the first host not to make it to the knock-out phase. Carlos Alberto Parreira you have a tough few months ahead. My home team, England, should make the second phase with some comfort. The USA will raise their game against the mother country, but I don't believe they have the weapons to hurt the English unduly. Algeria and Slovenia should not trouble Fabio Capello's men, though, if there is a banana skin, it could be the gutsy Algerians. Finally, Italy and Spain can rejoice, because they are far and away the favorites to advance from their groups, with Paraguay and Chile respectively, my choice to join them in the last 16. And that's my take on the draw. Though, as we all discovered when most of the big guns underperformed at the 2002 World Cup in Asia, when teams travel to unfamiliar territory, strange things can happen. And let's face it, whether you do this for a living like me, believe yourself to be an armchair expert, or are just a casual fan, we all know varying degrees of nothing until it all kicks off in June. Let the games begin. It is paradoxical that nobody noticed that so much anticipated drawing ceremony for 2010 WCH was not available on TV. This is in fact shocking considering all the "peoples' game" talk !!!! No TV coverage only validates those opinions claiming that today's' football has nothing to do with passion, openness, fair play and so on. Instead it is for the benefit of some faceless officials who have no idea about true virtues that football should represent (see the infamous Henry's hand play and consequent brushing off by FIFA of Irish case: no arguments, no real discussion. What we got was Mr Blatter laughing shamelessly. If the game is indeed to earn the name, everyone should be able today to see the ceremony on screen rather than listen to even most eloquent commentary by Pedro Pinto. Therefore for the sake of completeness and honesty CNN should bring this up and not pretend that football is still peoples' game. No TV coverage is one more indication that such description is becoming more and more contrafactual. We, the average South African, don't care much for the World Cup, it's raising very short term false hope in a society where violent crime is out of control. Once this World Cup hype is over the world will forget about Africa and it will be back to incompetent people "governing” a continent that most have given up on. A continent that should be exporting food, is rich in natural resources and commodities have been holding the begging bowl from the first day of independence. Africa is a bottomless pit and the world has realized this. The World Cup soccer is only a little blip on the radar and a year from new most South Africans will still be barricading themselves in their homes while criminals run wild. God bless Africa, I am just not sure which God. Terry, few points to remember. Since 1974 no favourite nation have emerged the winner of the World Cup in that respective tournament. There is always a couple of “upsets” in the first round itself. Adding to complexities barring Russia and Croatia, almost all the powerhouses of current soccer have qualified in 2010 World Cup finals. No wonder almost every group is looking tough (except one). Pedro Pinto with a Portuguese name, from England, this is your fellow Portuguese again. I know many experts are calling Group G the group of death including you but I disagree. I did a little mathematical calculation using the FIFA ranking table which correct me if I’m wrong is a pretty good measure of who’s the best and you will never believe which group ranks as the most evenly matched. None other than Group H, C & D almost dead even. Yup that’s right; I think Spain may have a tougher time than anyone expects especially those who already bet on them to win at all, as well as your English side and Germany. Group E & B are going to be 2nd most difficult, and finally groups G; A & F in that order with no doubt France & Italy have the easiest groups. In my opinion this is as logical as the so called experts and in no way do I think Portugal is in the group of death. In my opinion Brazil is overrated, with a history of individual stars not necessarily teams. I think Portugal has one of the most talented defenses of any team, and even though they had a tough time initially qualifying they have enough talent to go all the way if everyone is healthy and at their best including Cristiano Ronaldo. Unfortunately this might not be the case since many of the stars will also be the most beaten since they are also UEFA Champions or Europa League finalists. You might want to change that headline – which 'beings' are you talking about? With massive home support the modest looking Bafana Bafana should sail to the next stage without serious hiccups. Good luck to the hosts. I AM WRITING FRO THE REPUBLIC OF CAMEROON.THE DRAWS FOR THE WORLD CUP WAS FANTASTIC.I THANK FIFA FOR THEIR GOOD WORK. Never underrate any country, remember they all play in the same club, same league. What makes the difference here is the coaching crew. As for the countries, they all have quality players either in English league, sparnish league, seria A or german league. USA will beat England and I vory Coast will win the final. What about that? hello am from nigeria. but i think if our FA will do what is good for nigeria that is getting the services of a froreign technical coach it will help us in making an impact in this tournament.if we can put aside the politcs that have for all this period affect our sports in general, i see nigeria going as far as the quarter final. I wish South Africa the best of luck and hope they pull together as a team and win like the Bokke for Mandela. Else if you are attending SA is has lots to offer, great food, wine, site seeing, etc. First of all, you speak as if you can do a better job as a leader of an African country. You should remember ,that in the past, African nations have been raped of their resources to enrich the Western countries that colonised them. The Western countries that believed that taking resources without educating the indigenous people and leaving them with something of subsatnce-an EDUCATION. That is why Africa has so many problems and these problems are exacerbated by this lack of education...why my people fail to understand nor comprehend the consequences of their actions. Most Africans feel as if they have been cheated and they have a sense of entitlement to living a 'good' life. And for this fact, African leadership is forced to make promises which cannot be kept as funds on our continent are limited. Yes there are parts of Africa and South Africa that are not safe, just as their are parts of the US, Europe and Asia that are not safe. Johannes is an ignorant man, and for that his criticism is not warranted. In the words of Gandhi,"...be the change that you want to see in the world." For you Johannes-your country and continent. Africa's first World Cup will be a sucess for Africa and South Africa. The World must not be afraid to visit South Africa because of an ignorant man's comments. african will host the world cup successfully and am so happy for what the president of fifa has done to see this event be a great one .equally send tremendous thanks to caf president for his unrelented efforts and contributions to see the world cup a sucess in africa.and a million thanks to every who contributed tirelessly to see it move.